Take home your own slice of Victor Churchill for any occasion - from a catch up with friends, family dinner, boardroom drinks to an open house, our delicious assortment of rotisserie meat, charcuterie and cheese platters are made to order and customisable. From free range roast chicken and porchetta by the slice to duck fat potatoes, our daily selection is roasted on our imported French Labesse Giraudon rotisserie. Our burgers and rolls are served between 11am and 3pm for an effortless, delicious lunch to go. Enjoy an unforgettable Victor Churchill feast with friends and family in the comfort of your own home. Let us cater for you - many butchers' cuts like lamb shoulder, porchetta, and scotch fillet roast can be cooked on the rotisserie. Along with side vegetables and finishing sauces, our skilled chefs can prepare a customised menu that's ready for collection. See our friendly staff in store, call us on 02 9328 0402 or fill out our enquiry form below. 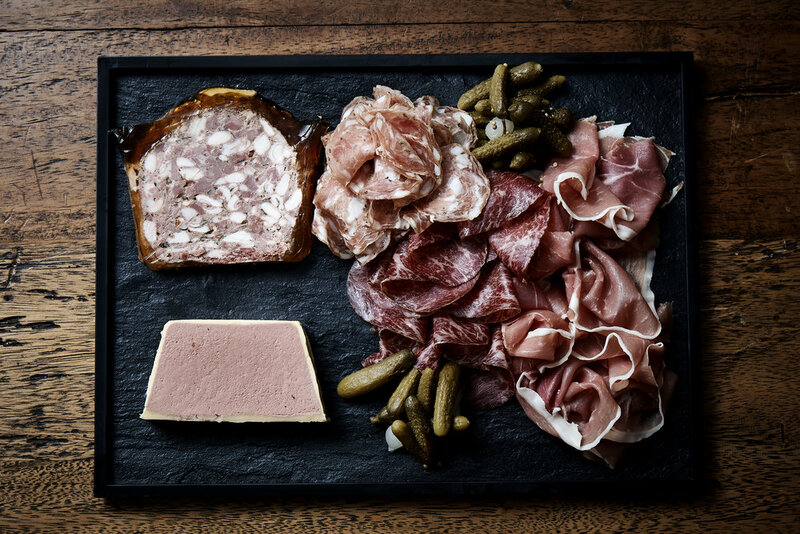 Our charcuterie platters are made to order using the finest house made terrines, rillettes and cured meat. We will curate the perfect platter for every occasion. Select favourites such as Blackmore wagyu bresaola or our housemade parfaits and terrines. Speak to our friendly staff with any enquiries. Our cheese platters are designed to showcase the seasonal varieties at their best. Accompanied by our house made chutneys and lavosh, it is a little slice of Victor Churchill with a lot of help from our cheesemongers. Thank you for your enquiry about home dining. We will be in touch soon.